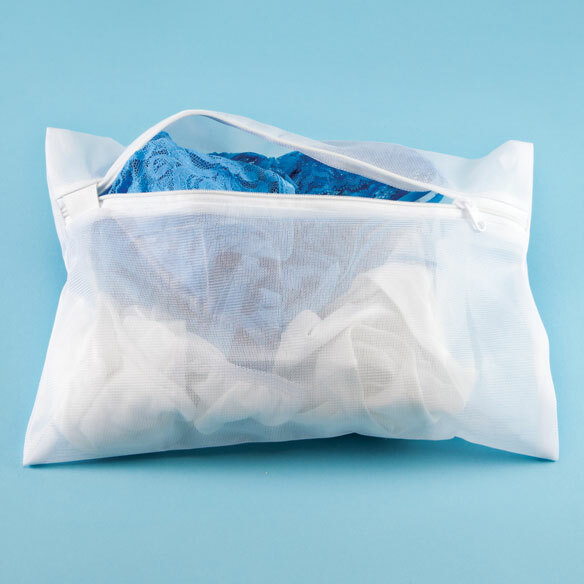 Mesh laundry bags end sudsing and rinsing of delicates by hand in the sink! Launder several pair of pantyhose, knee highs, anklets, without risk of snags or runs. Wash camisoles, slips, bras in the lingerie case. Nylon cases have full-length zipper tops. Set includes 2 small (13" long x 9" wide) and 1 large (28 1/2" long x 16 3/4" wide). Imported. Keep personal items in good shape not twisted and loose their shape. To keep my bras from getting tangled up with the rest of my laundry. Large enough for expensive nightgown. Mine have gotten old and this group of (3) have a good price. This will protect delicate items. Needed for small things in laundry.